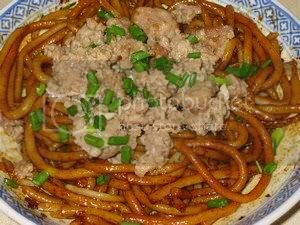 I grew up in Seremban and this style of fun which is a very thick lai fun with minced meat was my breakfast and you can buy them along the streets for only 10 cents a small bowl. It is still available at the eatery section of the Seremban Market but you would have to pay 2 ringgit for it now. It is still worth the money cos it is really delicious. I have found the dried lai fen can be eaten this way but prefers the thicker ones as they very similar to the real mccoy. Follow the instruction at the back of the pack of noodles and cook until noodles are soft. Heat the 3 tbsp oil and add in garlic, fry until fragrant. Add in ground pork and cook until pork is no more pink. Add in fish sauce and pepper. Put noodles in a bowl and put in water to cover the noodles. Heat in the microwave on high for 4 mins. Drain water and add in black soya sauce and a dash of soya sauce(meat could be salty from the fish sauce). Top with cooked meat and chopped spring onions. Enjoy with chilly sauce or pickled green chilly. I made this soup when we had burger for dinner. Celery is the only vegetable left in the fridge after a long absence to the store. I do have a few sprigs of chives in my garden though, good enough for garnishing. Cut the celery and onions into cubes. Heat oil and cook celery and onions. Add a pinch of salt to sweat out the liquid in the vegetable(do not brown). Add in the tbsp of flour and cook it through. Add in stock and let it come to a boil. Lower heat to simmer and simmer soup for 10 mins. Stirring now and then to prevent burning. When soup is done. add in pepper and adjust the taste with salt. Using the hand held plunger blender, blend. Soup is ready to serve as is or for a finer texture, pass through a sieve. 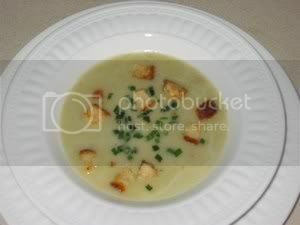 Serve with chopped chives, croutons and bacon bits. Cut bread into 1/2 inch cubes. Place in a baking tray and sprinkle with oil. Toss to mix. Bake in preheated 350 f oven for 10 minutes. Stir for even toasting. 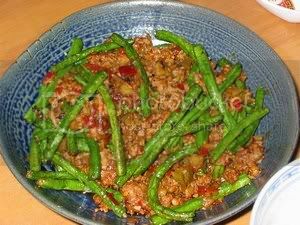 A flowery name has to be given to this simple dish which is long beans fried with minced pork. It's origin could be sichuan as it is spicy. 'Lueen' means young, 'kuan' is a baton, 'Chee Pak Kwai' is the piggy god in the chinese legend - The monkey god. 'Tar' is to beat or fight. so, figure it out. Heat 1/2 cup of oil and when oil is hot, put in a handful of long beans and fry until they are soft. Dish out and repeat. Remove oil leaving about 2 tbsp, add in shallots and garlic and stir fry. Add in black bean chili sauce and fry until fragrant. Add in minced pork and sichuan vegetable, stir fry until pork is cooked through. Add in water, soya sauce, sugar and pepper. Cook until most of the liquid has evaporated. Add in the fried long beans and chopped fresh chilly if using. Using the same buckwheat noodles for bi-bim naeng myun, this dish is eaten with cold soup and packets of soup base came with the noodles. The ingredients for the soup base are salt, red pepper, garlic, ginger, roasted sesame, onion, mustard oil and msg(of course). Suggested garnishings are hard boiled eggs, cucumber, pear, sliced boiled beef and mustard oil. I have cooked with what ever i have. Remove the noodles from boiling water and wash in cold water two or three times to cool and then drain. Bring 5 cups of water to a boil, add in squash and chinese cabbage. Turn of fire and allow soup to cool, then leave soup to chill in fridge. Put noodle in serving bowl and pour in prepared chilled soup. 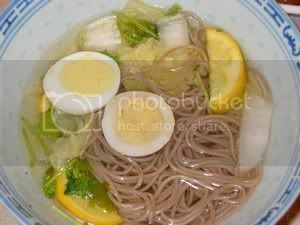 This recipe is from the packet of Buckwheat cold noodle. It is Korean. Remove the noodles fromboiling water and wash in cold water two or three times to cool and then drain. Heat 2 tbsp oil until hot, stir fry beef until it is cooked(the beef cooks very fast and can be left slightly pink). Mix the dressing in a big bowl. 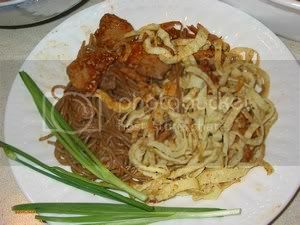 Put in cooked beef and noodles and toss until well combine. Top with the egg omelette.